Old houses can be stately & grand, but they can also be quirky, funky, drafty & dusty. If you love the charm and beauty of an old or historic home, be prepared for old fashioned floor plans, small closets, outdated fixtures, etc. 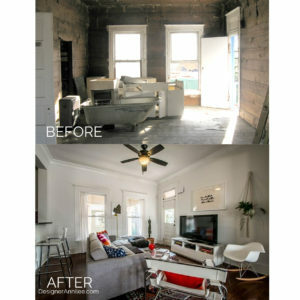 Be prepared for a possibly long and messy journey through the renovation process. It will all be worth it, I promise! Rushing through a historic home design is not a good idea. The more time you spend planning and preparing, the faster and easier the actual renovation will go. Many times there are factors beyond your control, such as Historic Review Commissions, Planning Permissions, Permits. These take time to prepare for, and the decision makers are usually on a back-logged schedule. You must first address any problems with the structure or systems. Look for failing foundations, leaking roofs, animal or insect damage, outdated wiring & pipes. You want your home safe and secure and functioning properly before you worry about how it looks. It might be tempting to pick out kitchen cabinets and paint swatches right away, but the first stages of the renovation should be practical rather than aesthetic. I know this is not the fun way, but if we install new beautiful tile, only to have the foundation shift and crack, or have the old plumbing leak, we’ve lost all our progress. Also, in any renovation, you must bring all new work up to current safety codes, so best to address it all up front. 4. You won’t always know what’s behind the walls. Frequently, even the most thorough home inspectors won’t be able to uncover an old home’s earliest layers, so you won’t always know what’s behind the walls until your renovation actually begins. Sometimes, that can be to the homeowner’s benefit. Scraping away“layers of inappropriate cabinetry, finishes, or siding can often lead to original millwork, flooring, or even fireplaces that can be restored to their earlier glory. But the opposite can also occur. Because you won’t always know the entire scope of the renovation process until demolition begins, it’s also a good idea to pad your budget for potential extra expenses. “Once you start making changes to a historic building, you can run into latent issues that haven’t been properly maintained for a long time. That part of the budget always seems to be sort of a wildcard,” Blanchard says. A healthy contingency fund is highly recommended for a restoration project. The right designer and contractors will make all the difference in your renovation and your experience. Not everyone loves and appreciates historic properties; finding a team that is willing to take time to work though the planning phase, appropriate selections, and quality workmanship is of utmost importance. Old houses are not typically a cheap fix. They do not have to be million dollar projects, but they will cost more than a quick flip of a newer building. Even if you don’t ever plan to sell, it’s smart to consider resale value when budgeting. Research what fully renovated houses sell for in the area and let that inform how you structure your budget. Have you ever seen a mish-mash house and cringed? Right, that’s not what we want. Identifying your home’s history and style is so important. Any renovation or addition should stay true to architecture and character of the home. This doesn’t mean you need to build a museum, but it does need to relate. The National Parks has a handy pdf guide. 7. Historic and Modern aren’t Mutually Exclusive. Your home doesn’t have to feel like a museum to preserve its historical significance. You chose an old house because you love the charm and history and memories and feelings associated with it. Take your time, choose people to work with that share your love, and have fun with the process.